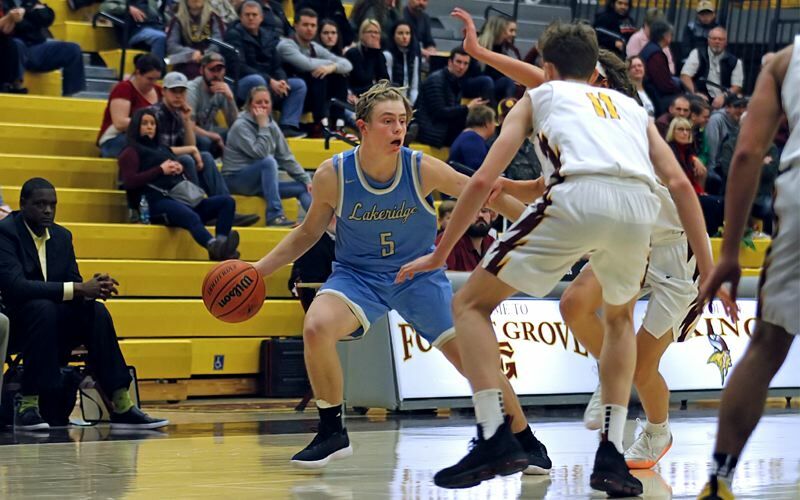 There were a lot of good things that came out of the Lakeridge boys basketball team's Friday road game at Forest Grove. But the first half was not one of them. The Pacers fell behind the Vikings by 18 points at halftime, but rallied the rest of the way and outscored Forest Grove by four points in the second half before falling 65-51 at Forest Grove High School. "We went into halftime and told the kids that we needed to get back to our brand of basketball," said Lakeridge coach Fred Gold. "We only scored 18 points in the first half and we have players that can score. We took a lot of uncharacteristic shots and I told the team that I hope we learn from that." With the loss, the Pacers — who beat Westview in their season opener — fell to 1-1 in non-league play. The Vikings, meanwhile, won for the third straight time and improved to 3-0. "We have a phrase — 'Chop wood, carry water' — and every day in practice we're concentrating on the little things," said Forest Grove point guard Guy Littlefield. "And it might not be fun at first, but it's not always about being fun, it's about the end result. And the end result tonight was getting the win." The Vikings were paced by a stifling defense that held the Pacers to just 18 first-half points, including a seven-point second quarter that didn't see Lakeridge get on the scoreboard until junior Cooper Justice made a free throw with 2 minutes, 30 seconds left in the first half. "Defensively we're doing a real nice job," said Forest Grove coach Greg Evers. "Coach (Jay) Mercer has done a great job with our gap defense and our length is really helping us out." The length is both inside and on the perimeter, with posts Henry Tonges, Dominic Funk and Ayden Purcell, as well as wings Adison Emerick and sophomore Braden Hudgins. The Vikings have long been skilled outside of the paint, but this year's squad is the first in a while that has had the type of length that can really cause problems for opposing teams trying to execute in the half court. That defense left the Lakeridge offense, which seemed befuddled from the start, more stagnant and unfocused as the first half progressed, something that Gold addressed with his team at the half. "Our whole conversation at halftime revolved around getting back to team-first," Gold said. "Passing the ball, moving, cutting, getting easy baskets and stopping taking difficult ones. We were definitely executing better in that second half." Forest Grove led 16-11 after one quarter and 36-18 at the half. In the second half, Lakeridge — inspired by its coach's halftime speech — came out with a heightened level of energy, moving the basketball and getting easy scores through a series of screens and cuts. Justice was doing the job on the inside while guards Nima Vaday and Lawrence Chen — who combined for 23 points — did their work on the perimeter to instill a bit of hope in the Pacers players. But the Vikings matched their intensity nearly play-for-play and never allowed Lakeridge closer than 12 points en route to a relatively easy 14-point win. Much of the credit for the victory goes to Forest Grove's aforementioned defense. "We did great," Littlefield said. "Our defense is amazing right now and it's taken leaps and bounds since last year. It's something we've been working hard on and are really proud of." That, however, wasn't all the Vikings did well. Littlefield, who struggled to get going in the first two quarters, heated up in the second half and ultimately finished with 19 points. The 6-foot junior repeatedly beat Lakeridge guards off the dribble and did much of his damage at the rim. "In the first half, they did a nice job of containing him, but in that second half, he did what he's been doing," said Evers. "His ability to beat guys off the dribble, get to the basket and finish has been phenomenal." Littlefield leaned more towards the team in the wake of postgame praise, citing his squad's team-first mentality as the primary component of winning. "We have a lot of trust in our guys and have the mentality that if you're open, shoot the ball," said Littlefield. "We have a lot of faith in one another and believe anyone can score within the framework of what we're doing." Meanwhile, Gold could relate to Littlefield's assessment, but unfortunately for the Pacers coach, doing so spoke to the inadequacies of his own team, at least on this night. "I thought we got out of character," said Gold. "Our mindset this year is 'Team first,' and last Tuesday against Westview, we played that way. But tonight in that first half, we didn't. We got out of ourselves and we see the result." In addition to Littlefield, Forest Grove's Emerick finished with 13 points, while Hudgins added 12. Lakeridge was paced by Justice, who finished with 17 points and six rebounds.